2018 bought warm and dry conditions to the Race. This year also lacked the usual cooling winds up high along the Ridge. I’m not sure, but it may have been the warmest Ridge Run in the 33-year history of the Race. One could check historical weather data to verify. Late afternoon saw race day temperatures at least in the high 90’s in the finish area. Race director David Summerfield speculated that Bozeman may hit 100 degrees race day which it hadn’t in 15 years. Regardless, I think the race just happened to take place on warmest day of 2018. So obviously the warmth played a factor in most people’s race experience. Heat typically does not bother me, but for some reason I suffered severe muscle cramps that really slowed me down and made the second half of the race a painful struggle to complete. My hamstrings were the first to start cramping as I neared the half way point of Bridger Bowl. Flexing my leg to step over rocks or downed logs would cause my hamstrings to seize up in a cramp. Taking a bite out of some fresh spicy ginger root has helped me manage cramps in the past so I employed that strategy. It would temporarily help, but it was not a permanent solution and I got to Bridger in a state of worry and concern. After Bridger, my Quadriceps and Adductors also started to cramp. The rolling terrain between Bridger Bowl and Baldy presented a multi-dimensional challenge. My Quads would cramp going downhill, my Adductors would cramp going uphill and my Hamstrings would cramp trying to run on the level areas. My calves never cramped. Frequent chomps on a bit of ginger root or licking salt sprinkled on my hand, just did not do the trick of relieving the tendency to cramp. The theory of munching on ginger root is that a very strong spicing tasting substance like ginger or salt divert nerve signals from the cramping area to the mouth giving the cramping muscle a chance to relax. It is kind of a nervous system diversion or distraction technique. Mustard, peppermint and pickle juice are also supposed to help. There is a product called HOTSHOT based upon this theory. I’ve never tried HOTSHOT. It has mixed reviews and is expensive for what it is. 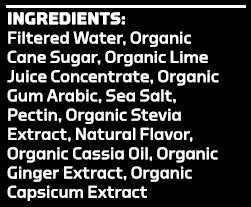 Perhaps I will add a little cassia (cinnamon) and capsicum (cayenne) to my ginger and salt to better match their active ingredients. Descending from Baldy to the Finish line was a real struggle. My Quads were painfully cramped up resulting in stabbing pains with every step on the steep downhill sections. It was slow going and I just had to press on. No one was going to get me down the trail for me. The result was my slowest finishing time ever. Last year, 2017, I had a freak accident 3 weeks before the Ridge Run that resulted in major trauma and injury to my leg. It forced me to do the race with my left leg immobilized with a brace and tape combination. I figured I could stiff leg shuffle, gallop and skip through the race using ski poles in about 5:30. Somehow, last year, I ended being 45 minutes faster than I expected. Now, a year later, although my leg is permanently disfigured, at least it functions enough that I can hike and run without a knee brace and ski poles. 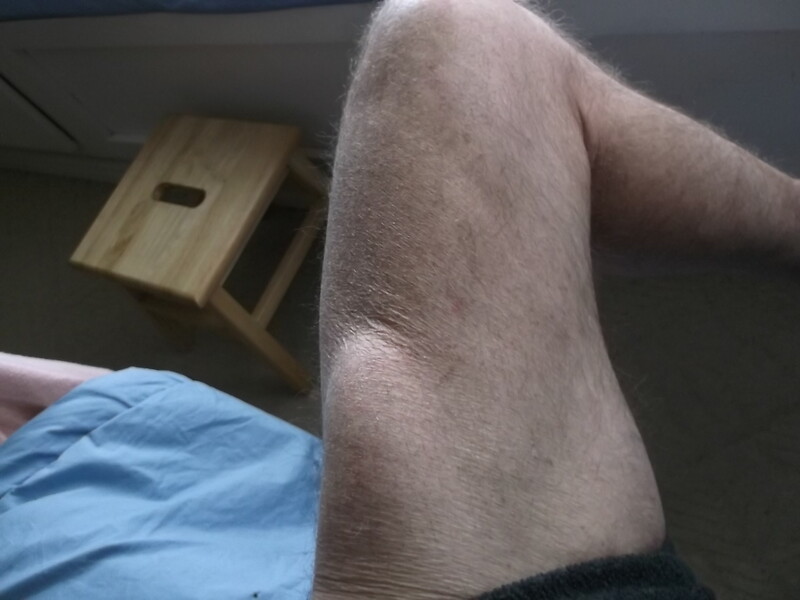 For an old man like me, the high expensive of reconstructive surgery and a muscle graft is just not worth it and surgery is not without risk. Based upon recent training, this year, I figured I could do the race in 4:30. But 2018 found me 45 minutes slower than I estimated. One just never knows. Every year is different. Some are more humbling than others. 2018 marks the most I have ever drunk during the race. I started out carrying a full 24oz water bottle and refilled it on course 4 times. That is 5 X 24 or 120oz total. A cup, 8oz, short of a gallon. Usually I drink between 72 and 96oz during the race. This year, out of curiosity, I weighed myself before and after the race. By the time I got home (about a half hour after finishing) and had a chance to weigh myself after the race, I had consumed another half-gallon, 64oz, of liquid. The scale indicated I had still lost nearly 9lbs from the morning weigh in. So what does all this mean? Well for simplicity, figure that 9lbs is mostly (not all) water weight. I lost a net 9lbs or over 1 gallon of water while ingesting (120+64) or just under 1.5 gallons of water. It is hard to get an exact figure because I also drank 24oz after I weighed myself in the morning, but before the start. I also pee’d twice before the start and once during the race. One could estimate I sweated out at least 2 gallons of water during the race and the half hour after the race. Wow, that seems like a lot! Especially for someone that usually weighs about 145lbs. Perhaps I should of drank more during the race? I never felt overheated, dehydrated or extra thirsty, but maybe I was and perhaps it was contributory to my cramping problems. There is no way to know for sure. This following post is a response to a recent question in the comment section of the post on training for a 3 hour marathon. Yes, some shoes are certainly faster than others. Ignoring factors such as comfort and fit, in general, the lighter the shoe the faster and the more energy return the faster. At the time of this writing, the Nike Vaporfly 4% appears to be the fastest running shoe available to the general public. How much faster? Nike claims 4% but it varies from person to person. There are probably some people that may not see much if any improvement in their race times and some that may see more than 4%. Take note that the world record for the women’s 100 mile run just got lowered by a whopping 7% by a woman wearing the Nike 4%. The only way to find out how much they help you is to experiment with them. Comfort is probably a more important parameter when choosing what shoe to race and train in than speed – especially for long events. A shoe that causes you pain or injury outweighs any speed benefit. 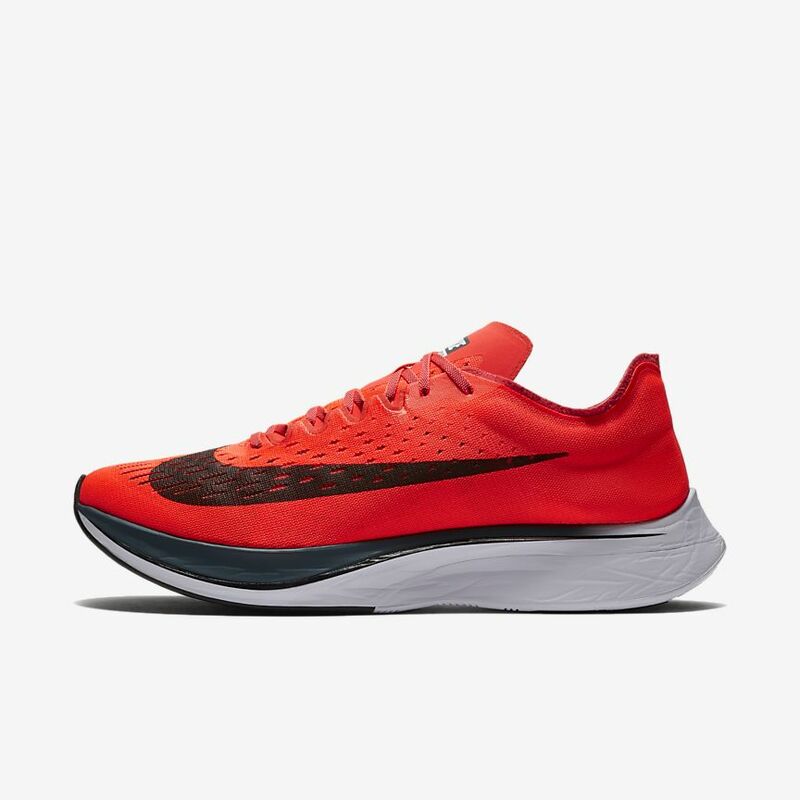 But if you are looking for the fastest running shoe available for long distance events, the Nike Vaporfly 4% appears to be it. 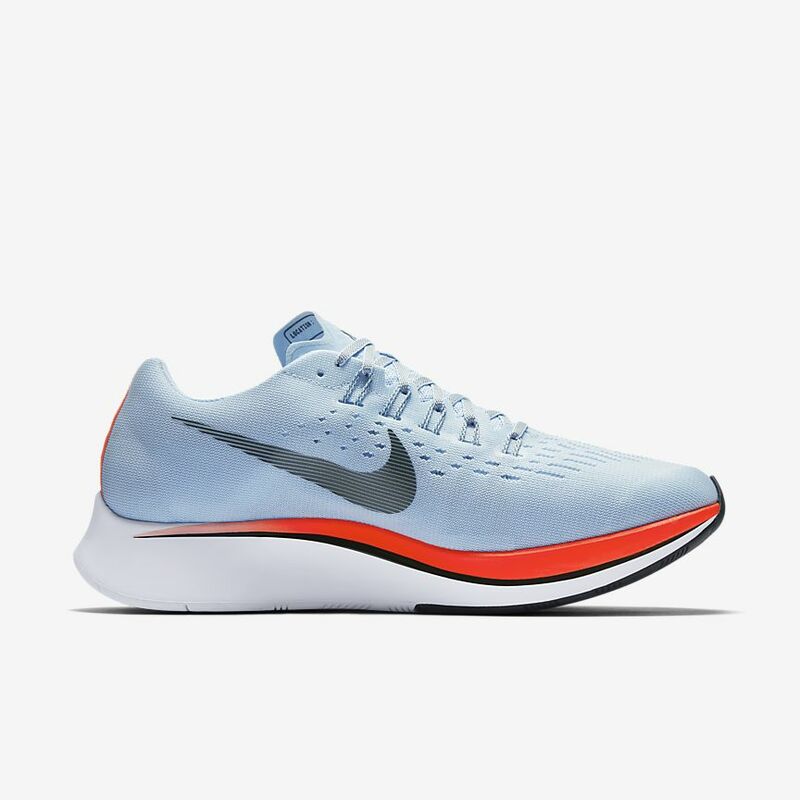 The Zoom Fly is a close second being slightly different with less costly spring plate material. Considering their cost and fragility, save them for race pace and faster training. Also, keep them limited to running on the road, track or treadmill. They are too fragile and unstable for trail running on rough and uneven surfaces. Be aware that some sports science pundits have called for a ban of the Nike 4% because it gives an unfair advantage to those using them. They claim that the carbon fiber plate sandwiched in the thick foam sole constitutes a mechanical spring aid – a realistic claim. The idea of using a spring plate in a running shoe to increase energy return has been around for decades. Nike is the first company to finally succeed in creating a viable commercial product utilizing this concept. By essentially taking a shoe with a thick midsole of very lightweight cushy foam (think Hoka Clifton 1) and embedding a stiff (but lightweight) spring pate inside the midsole, they stumbled upon a concept and combination of cushion and spring that really works. And we runners get to benefit from it! Just remember, no shoe can do the work for you. You still have to train and put in the effort to run fast. 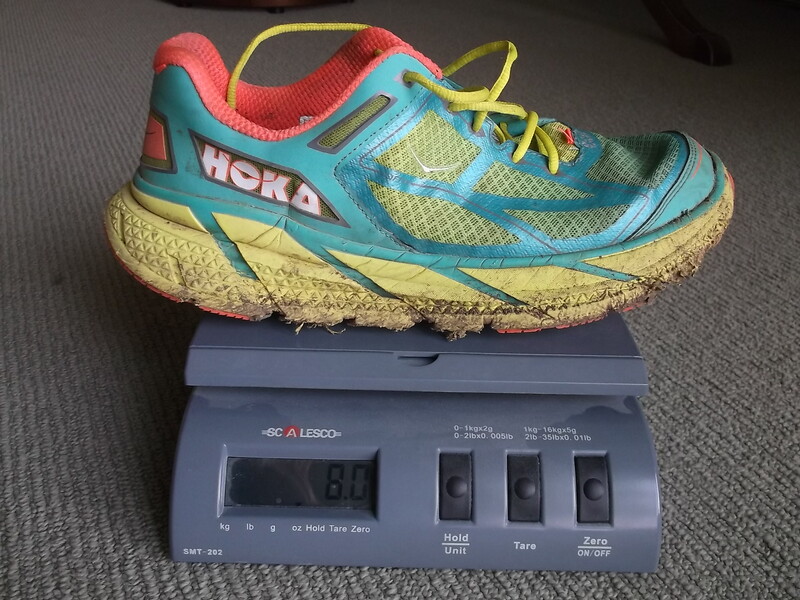 My personal favorite trail running shoe of all-time is the Original Hoka One One Clifton (Circa 2014). Over my lifetime, I’ve used a lot of different types, brands and styles of shoes. Some were excellent trail running shoes and were memorable like the Nike Air Terra and Adidas Feet You Wear from the early 1990’s. The Nike Zoom Trail from the mid 2000’s was and is still a favorite (probably my second favorite of all-time). 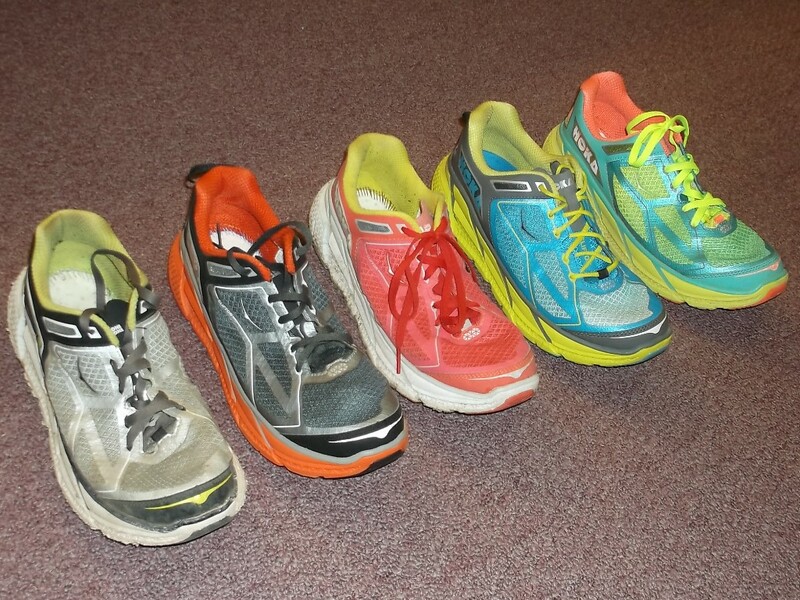 But the Original Hoka Clifton from 2014 is my all-time favorite. The Original Hoka Clifton is light, comfy, responsive, flexible and protective. It makes running fun. The only downsides are they are fragile (not lasting very long) and their traction is lacking on slippery terrain. Granted they are intended for the road not the trail so their sole is not designed for grip. As a road shoe, I interestingly find them less appealing feeling overly soft and mushy on the roads. Yet somehow the Clifton has a certain magic feel on the trail. Maybe there is a resonance or synergy between the shoe’s softness and soft trail surfaces. The combination just works. 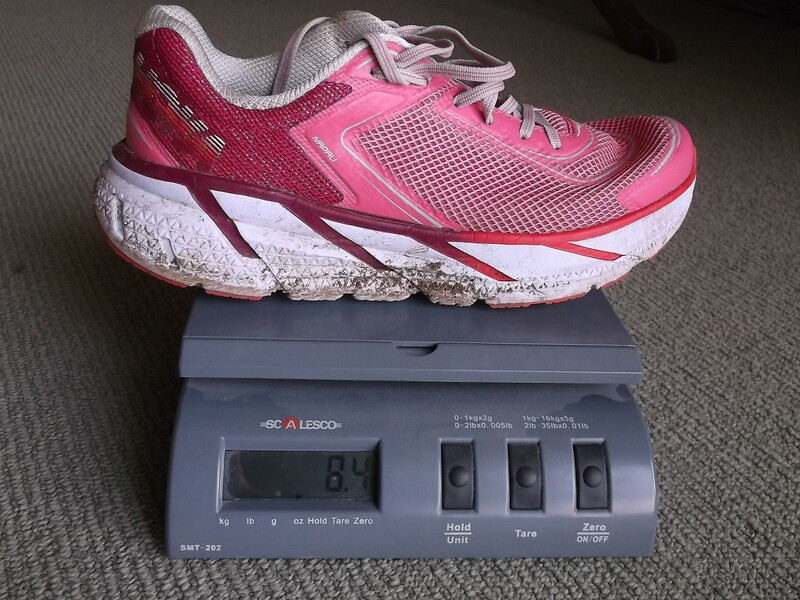 Yes, Hoka has a trail version of the Clifton, the Challenger, but it is heavier and has a dead feeling compared to the Clifton. There are newer versions of the Clifton (2,3,4) that address some of the lack of durability issues of the original Clifton. Unfortunately, each newer version is heavier and takes away some of the magic feeling of the original. 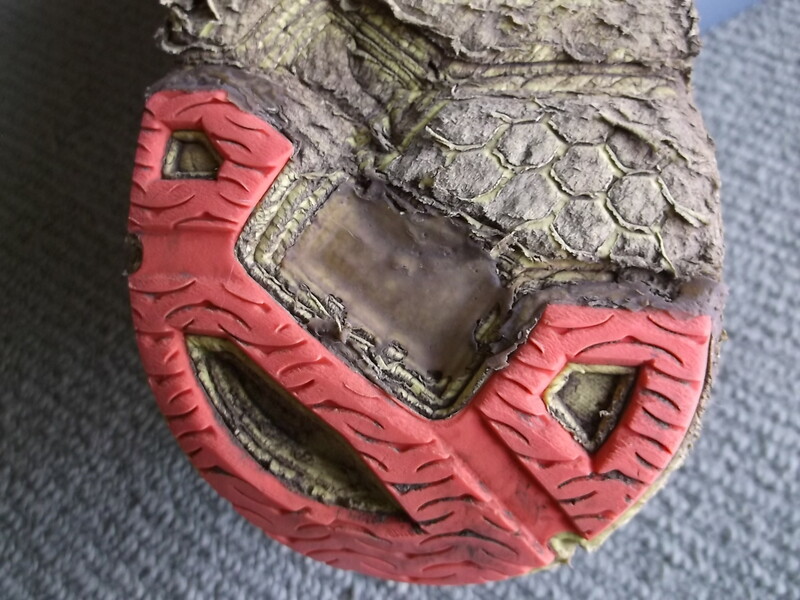 Another sorry tale (Saga of the Skechers GoRun) of how a shoe company ruins a great shoe with so called improvements in succeeding versions. You can still find a few pairs of the original for sale at outlets and resellers, but soon they all will be gone. Until something else comes along, I will be cherishing running in my remaining Cliftons until they all wear out. The most popular post on this Blog is a minimalist approach to training for a 3 hour Marathon. In my experience, a 3 hour Marathon is equivalent in effort and training commitment as a 4 hour Ridge Run. The target audience for a post about doing a 4 hour Ridge Run is very small and localized compared to a global audience of those interested in doing a 3 hour Marathon. Nevertheless, there has to be at least a handful of people interested in a running a Four Hour Ridge Run. Now if your goal for the Ridge Run is different than finishing in 4 hours, don’t worry, you can also scale the following training plan for other goals besides 4 hours. Start by adjusting the typical splits in the table below by the ratio of your goal time divided by 4. For example, if your goal is 8 hours, double all the splits. If your goal is 6 hours, multiply all the splits by 1.5 (6/4). If your goal is 3 hours, multiply all the splits by 0.75. Same as for a 3 hour marathon (19 minute 5K capability and history of at least 1 year of 3 hours or more per week of running). Any changes to this would be the addition of a history of at least a year of some of those 3 hours a week of running being done on rocky trails. Below are some suggested splits and elapsed times for different sections of the Ridge Run course. Times are in Hours and Minutes. With the exception of Sacajawea Pass, all the locations correspond to prominent points and aid stations. I’ve included the split to Sacajawea Pass as a check; mainly to make sure you do not start out too fast. It is easy to start fast, but you can pay for it later in the race with premature fatigue. Save yourself for the runnable sections later in the race. These are guideline times. If you are a better climber than descender, adjust those sections that are mostly uphill a bit faster and the downhill sections slower. Likewise, if you are better at bombing down the descents, adjust those sections that are mostly downhill a bit faster. Everyone is different with regards to skills and what sections they will find challenging slow or easy and fast. The unique characteristics of the Bridger Ridge Run of rocky steep terrain put extra demands on your abilities as a runner and your body. This shapes the way you must prepare and train if you are to have a successful experience come race day. Building durability and toughness to handle the steep ascents and descents is imperative. So is the specificity of training at race pace on the course itself. High intensity training helps build fitness, speed and strength. This is a minimal or just enough training plan. It is specifically focused on the goal of a 4 hour Ridge Run. It emphasizes training in the Bridger Mountain Range on the Bridger Ridge Run course. If you live near the course, that works. If you don’t live nearby, then you need to find some suitable terrain that closely matches the rocky steep terrain of the Bridger Range. This plan consists of just 3 different training sessions that are repeated each week. Always give yourself at least one day off between these challenging workouts. They progress in duration over the course of the 14 week preparation period to race day. Given that the race is the Saturday after the second Friday in the month of August, 14 weeks before that is around the beginning of May. If you are serious in preparing for and training for the Ridge Run plan on starting your tailored Ridge Run training the first week of May. Besides the 3 targeted sessions presented here, you should stay active every day, but at a low intensity. Doing more hard training each week than what is presented here, may lead to injury by overdoing it and compromising your training and goal. Once a week do a steep trail run. Start with 20 minutes up and 10 minutes down. Build up to 1:20 up and 40 down by week 7. Hold that duration till week 12 and cut it in half the next two weeks. For those that live in Bozeman, the M to Baldy trail is very convenient and ideal for this training session. A good estimate of your Ridge Run potential is to double your round trip M to Baldy time. So if you can get all the way up to the top and back down Baldy in 2 hours (1:20 up 0:40 down, approx. 4 miles 4000 feet elevation gain), you are on track for a 4 hour Ridge Run. Your average pace going up is 20 minutes per mile. That is 3 miles an hour and may seem slow, but it is a steady power walk considering the average grade is 20%. You end up climbing 1000 feet every 20 minutes. Likewise, descending 4 miles in 40 minutes is 10 minutes per mile. This also may appear rather slow for running downhill, but the technical nature of this trail makes running 10 minutes per mile seem fast and challenging. Going up and down Baldy once every week, is redundant and boring, but it is a great workout and a terrific gauge of your fitness. I’ve known several people that employed going up and down Baldy multiple days each week as successful Ridge Run training. Set aside one day a week to do hill repeats. Consistency is helpful so pick a day of the week and a time and stick with it. Choose a steep but runnable hill that takes about 3 minutes to get up. Take 3 minutes recovery by jogging back down to the bottom. Repeat. Start with 2 the first week and build up to 10 by the 10th week then decrease back to 2 the week of the race. These workouts build strength, power and aerobic capacity. Run them hard at nearly max effort. When you get to the top, you should be gasping for breath, glad you made and looking forward to recovering on the way down. You should be able to find a suitable hill on the trails near Bozeman such as Sypes Canyon, the M or Bridger Bowl. You can also use an incline treadmill. 10% grade at 7.5 mph or 15% grade at 6 mph are some possibilities. Set the incline and pace combination so 3 minutes represents about as long a time as you can last. Recover in between the uphill portions with 3 minutes jogging at 0% grade (4 to 5 mph). This workout consists of running a section of the course at race pace. The goal of this workout is to not just get accustom to running at race pace on the course, but to integrate it into your comfort zone and skill set so it becomes habit and second nature. Given the technical nature of the rocky Ridge Run course, this will also build coordination and skill with your footing. Spending so much time on the course gives you the opportunity to really get to know it so you will have no excuses for going off course. In most cases, you must combine this workout with some easy running or walking to get to or get back from the section of the course run at race pace. Keep the race pace portion of these workouts under 2 hours and the total time out including the approach and return under 4 hours. The progression builds to mid-July where you will do the first half of the course (Fairy Lake to Bridger Bowl) and the second half of the course (Bridger Bowl to the M) at race pace. Space these maximal sessions out by at least a week. The progression then backs off so that you do shorter sections of the course as race day nears. Following are some training session suggestions. Your choices in May and June may be limited by snow. Many of the sessions will require either accessing the course by hiking up to the top of Bridger Bowl or descending from the top of Bridger Bowl to get down off the course. Some require doing an out and back on a section of the course. It is also possible to access the course at Ross Pass. Depending on the year, there still could be lots of snow in the Bridgers in May. This limits the ability to train on most sections of the course until June or even July. 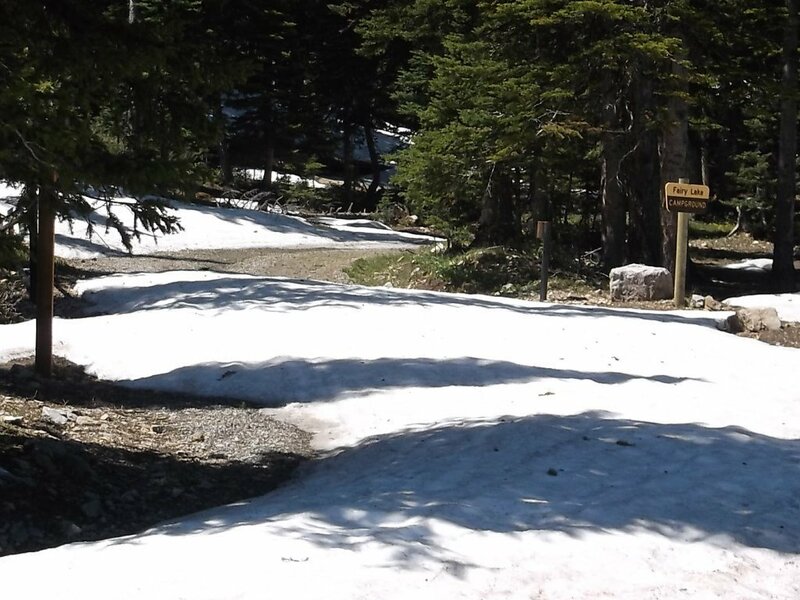 The road to the start at Fairy Lake usually does not open until beginning of July regardless of the snow pack or lack of. Until then, you may be limited to doing the long course specific runs in other places or on the M to Baldy section that tends to melt off the earliest. Until July, you may have to hike, run or bike up a portion of the road to Fairy Lake to access the trail up to Sacajawea. There is a section of the course between Bridger Bowl and Saddle Peak that tends to hold snow. It is on the west side of the Bridgers above the Bostwick canyons and is a steep side hill. Traversing this section when covered in snow requires caution and will slow you down well below race pace. Most of the rest of the course, even if covered in snow does not pose the same exposure threat requiring as much caution. Since the race takes place in August, snow is rarely an issue on race day. Occasionally (last time was 2005?) the course will be graced with fresh snow but no old snow pack. So for specificity’s sake, it makes sense to stick to training on portions of the course that are free of snow. Since the Ridge Run course is point to point, training on the course will inevitably require organizing a drop off and pick up at specific locations along the course. You can drive right up to the Start at Fairy Lake and also the Finish at the College M. You can drive within an hour or so walk of the top of Bridger Bowl and also Ross Pass. So having a training partner to stage shuttle vehicles with or a willing spouse to drop you off or pick you up is essential to training on all the portions of the course. Otherwise, you will have to retrace your steps which can force you to be out for a longer time than ideal. There are some informal training groups that organize running at least the first half and second half of the course during the summer. A good resource and networking connection for this is the Bozeman area running club, Wind Drinkers. If all else fails, leave a comment here and I will give you some individuals to contact. Plan ahead, as I only respond to comments on this blog a couple times a month. If you are highly endurance trained and can run for many hours before your energy fades, then you do not need to worry much about fueling. There are many individuals that have done the Ridge Run under 4 hours without any fuel whatsoever. On the very first Ridge Run (1985), Alex Lowe told me he had no water or fuel at all. He finished 2nd in well under 4 hours. There were aid stations that first year, but none were setup before the fastest runners went by. The winner the first year did have candy pinned to his shirt, but did not share any with Alex. My first few Ridge Runs were done with little to no thought to fueling. I mainly just drank a bit of water. The first part went fast (I was a much faster runner 25 years ago) but typically around Saddle Peak (between Bridger Bowl and Baldy), I would fade significantly as I ran out of energy. My fastest elapsed times to Ross Pass (1:05) and Bridger Bowl (1:50) date from the early nineties, but I would lose a lot of time after that and typically finish in 4:15. The first time I broke 4 hours was the first time I forced myself to refuel as I drank nearly a half-gallon of Gatorade at the Bridger Bowl aid station. It prevented me from fading in the later portions of the course. I’m now much slower, but wiser as I have learned to strategically fuel. My most recent time as an old man in his late 50s is about nearly the same that I ran it in as a young man in his mid 30’s. Now, my fueling goal is to consume about 800 calories total during the race. That is about 200 calories per hour. This works for me. It is enough to avoid running out of energy but not enough to cause stomach distress. Over the years, I have learned to drink between 64 and 96 ounces of water during the race depending upon the weather (heat). This is 16 to 24 ounces an hour. Again, this is typical. Some people can get by on a lot less. Some need a lot more. My preference is to carry a 24 ounce water bottle and refill as needed at aid stations. There are many older posts on this blog discussing gear such as shoes, clothing and packs. Start by looking here. Unfortunately, many of my favorite pieces of gear are no longer sold. There are items currently sold that are similar.